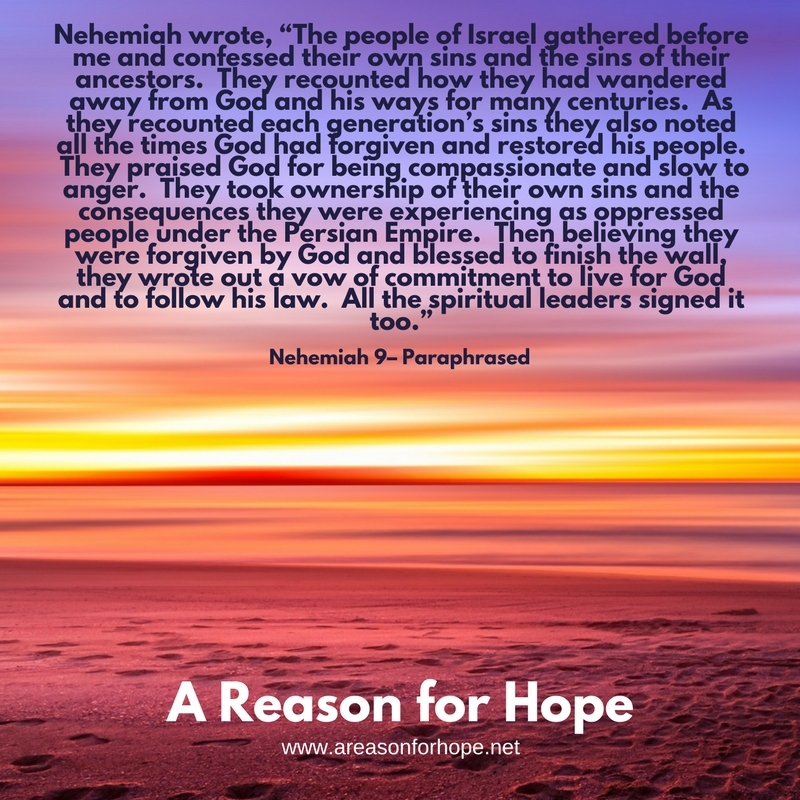 Nehemiah wrote, “The people of Israel gathered before me and confessed their own sins and the sins of their ancestors. They recounted how they had wandered away from God and his ways for many centuries. As they recounted each generation’s sins they also noted all the times God had forgiven and restored his people. They praised God for being compassionate and slow to anger. They took ownership of their own sins and the consequences they were experiencing as oppressed people under the Persian Empire. Then believing they were forgiven by God and blessed to finish the wall, they wrote out a vow of commitment to live for God and to follow his law. All the spiritual leaders signed it too.” – Nehemiah 9 paraphrased. We find no rest for our souls until we find our rest in you. Just like the Israelites who realized that their biggest problem was their own wayward hearts, I know that sin is my biggest problem, too. I am your problem when I wander away from you just like my parents and grandparents before me. But you were gracious to them and blessed them in spite of their sins. I believe you will bless me, too, because you are the God who is slow to anger and full of compassion. Oh Lord, forgive me of my many sins and help me keep my commitments to follow you. Walk with me through my day and cover every moment and interaction with grace. Make me a great partner for your Holy Spirit to speak his truth and love to those who need it, including my own needy soul. The foundation of all true spirituality is contrition over sins and faith in a forgiving God.